Shillong is a beautiful hill station in the state of Meghalaya. Every year many tourists from across the country visit Shillong to experience the natural beauty of it in abundance. With high daunting peaks, there are some spectacular waterfalls. 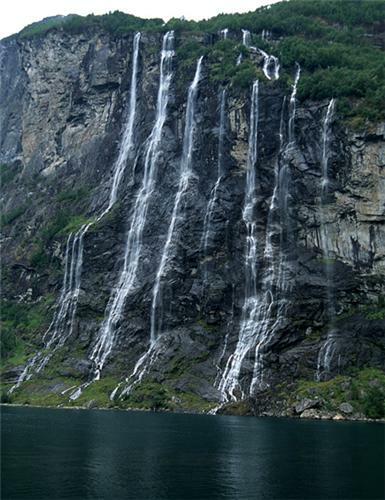 These waterfalls present a beautiful sight for the tourists to enjoy the natural scenery. The Bishop and Beadon Falls are two high waterfalls located in Suna valley within the Shillong city in Meghalaya. The falls are situated off the Guwahati road at Mawprem. The two falls cascade in good flow. The waterfalls are one of the major tourist destinations of Meghalaya. The Bishop falls is a three tier waterfall. It has a height of 443 feet. The Beadon waterfall is located 2 km from the Bara Bazaar area. At the base of the waterfall there is a hydroelectric powerhouse. It is located near the Bishop falls. Both the Bishop and Beadon falls flow into the Umiam river. The Bishop is also called the twin brother of the Beadon falls as both the falls cascade from the same ridge into a deep gorge. The Bishop and Beadon Falls form the primary tourist spots of Meghalaya. Tourists are attracted by the enchanting beauty of the waterfalls. The rocky surroundings, the green landscape and the natural vegetation of the site spellbound the onlookers. The crystal clear water of the falls cascading down of almost 1000 feet to crush rocks beneath is awe-inspiring to the tourists. The Bishop and Beadon Falls are located amidst dense forest. Tourists can also trek in the valley. Both the falls can be viewed from a point that could be reached through a narrow road at Mawlai. The falls could be visited throughout the year as they maintain good flow all year round. But a visit during the monsoon could be fruitful as during monsoon the falls are at their best. The Elephant Falls is located in East Khasi Hills district in Meghalaya. 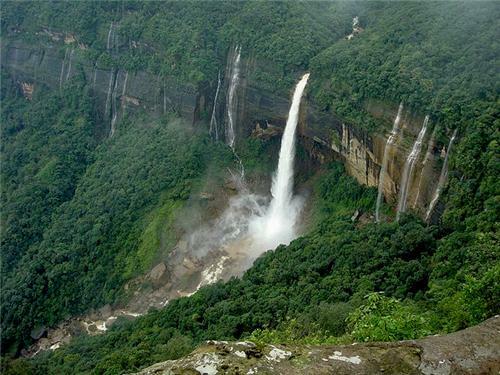 The waterfall is situated at a distance of 12 km from the Shillong city. It falls at the outskirts of Shillong. The water falls at three successive levels. There is the top, middle and bottom level at which the beautiful water gushes down. The stream has a colossal volume. The name Elephant falls was given by the British. The falls prior to the British was referred to as Ka Kshaid Lai Pateng Khohsiew (three steps waterfalls) by the Khasi people. It was called so as the fall cascades in three successive sections. The British referred to the falls as elephant because there used to be a rock near the fall resembling an elephant. The rock was however destroyed in an earthquake in 1897. 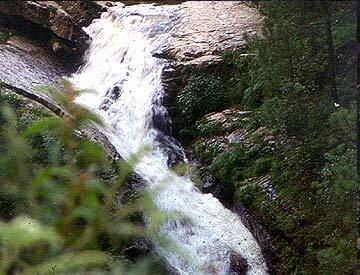 The water of the fall cascades in three segments. Of the three falls the bottom of the fall is the most beautiful. Each of the falls could be reached through the stairs. There is also a bridge in between for crossing. 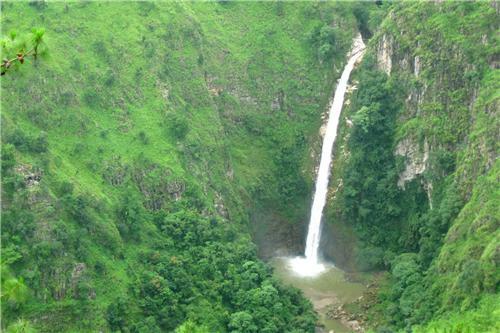 During monsoon, elephant falls is at its pinnacle when the stream cascades from the above down to the successive segments. Elephant falls is one of the major tourist attractions of Meghalaya. It draws large number of tourists from across India. To the local people the fall is a major outing place. The best time to visit the fall is during July and August. During this time of the year the fall is at its great volume. The waterfall cascades from a height of 96 metre to fall below a deep gorge. The sweet falls is thronged by local visitors as well as tourists from across the country. The rock-surrounded fall is awe-inspiring to the onlookers. During weekends a large number of people could be seen around the falls. The sweet fall is slender and resembles a straight pencil of water. It drops vertically over a distance. Water that cascades down from above produces a wonderful effect on the onlookers. The area is surrounded by green vegetation and blooming flowers that adds to the beauty of the falls. The sweet fall is a perfect picnic spot. 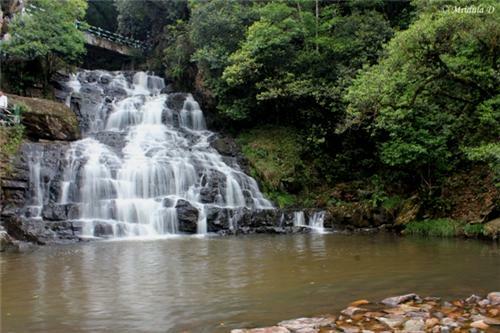 The Spread Eagle Falls are located around 3 kilometres from Polo Grounds within the boundary of Shillong Cantonment. The striking waterfall gives the impression of an eagle spreading its wings and it is named as Spread Eagle Falls. There are steep cliffs along the sides of the waterfall and a pool of water below where the water gushes down. The falls are locally known as Urkaliar or the falls into which Ka Liar slipped. According to an ancient folklore, a female named Ka Liar while wondering and admiring the beauty of the place along the steep cliffs when she missed her steps and fell into the water. Thus it received the name of Urkaliar. The Crinoline Falls is situated in the heart of the Shillong town. The falls is located at a walking distance from the Lady Hydari Park. The gushing sound of the waters can be heard from a distance of meters away. The top of the Crinoline Falls is covered with green bushes and trees. At the base of the falls, there is a Crinoline swimming pool and is named after the falls. The pool was initially developed for the purpose of relaxation of the recuperating soldiers during the Second World War. After the war, however it was run by a private agency and was made open for the local people. After few decades, the State Sports Authority took charge of the pool. Swimming is one of the sports activities of the pool. There is also a restaurant near the falls with different cuisine types for the tourists. The tourism department of Meghalaya regularly conducts programmes and occasions on the bank of the swimming pool.